A good Sunday to everyone! I'm still busy making the most of my baking weekend but I have things prepared to share. Today, we're making Neapolitan Marshmallows. They're tasty little bites, flavored just like neapolitan ice cream with layers of chocolate, vanilla and strawberry. Now, you can probably tell just by looking at them that they're going to be a wee bit time consuming but hey, they're adorable! Pretty takes time and these are probably the cutest confection I've made in a while. I can already see them dressed up in little bags and chocolate colored ribbons, ready to be gifted. This will be a fairly large batch of marshmallows. The recipe today will fill a 12" x 18" half sheet cake pan approximately 1 inch deep. I was considering halving it for a 9" x 13" in the recipe post below but decided against it. Since this recipe requires a relatively hefty time investment for marshmallows (~2hrs) and they're so screaming cute, I figured folks would be making them to primarily to share/give-away/show-off, so why not keep the batch size large. That and larger batches of marshmallow are easier to prepare and handle than smaller ones. I will note that I had considered making the strawberry layer flavored with strawberry puree rather than strawberry candy oil, but I figured that would really be pushing it in terms of effort. Of course, If you desire the real thing, I suggest checking out the book linked below for fresh strawberry marshmallows. I don't usually push cookbooks on the blog, but I do love this book. If you're at all a homemade marshmallow fan, consider downloading the Kindle version to your mac or pc. It's cheap. a 12" x 18" sheet. That's... a lot. Prep your pan with a little non-stick spray oil and wipe out the excess. If you lack a half sheet pan, you can prepare a marble pastry stone or a section of clean non-porus countertop with a thin coating of oil. Your marshmallow slab won't have perfectly square edges during the process but you will be able to trim it up and make it even after it sets. Mix together the ingredients for the slurry until smooth and set aide by the stove. Combine the ingredients for the base in a large, heavy-bottomed pot and set over medium high heat. Stir until mixture boils and sugar is dissolved. Keep the sides of the pan clear of sugar splatters with a damp pastry brush. Cook without stirring until the mixture comes to 260°F. While the mixture is cooking, combine the ingredients for the bloom with a small whisk. Mix until free of lumps and set aside by the stove. When the base hits 260°F, remove from heat and stir in the bloom. The mixture will bubble up, so I hope you listened to me when I called for a large pot. Add the chocolate slurry and mix to combine. Pour the hot mixture into the bowl of your stand mixer. Using the whisk attachment, gradually bring the mixer to high speed. There may be splatters as the marshmallow mixture starts off frighteningly thin. Feel free to cover your mixer with a towel until the mixture cools and thickens. Beat the marshmallow for 18 minutes on high speed. Spread the thickened marshmallow mixture evenly into your prepared pan. Combine the ingredients for the base in a large, heavy-bottomed pot and set over medium high heat. Stir until mixture boils and sugar is dissolved. Keep the sides of the pan clear of sugar with a damp pastry brush. Cook without stirring until the mixture comes to 250°F. While the base mixture is cooking, combine the ingredients for the bloom with a small whisk. Mix until smooth and free of lumps. Set aside by the stove. Once the mixture hits 250°F, remove from heat add the bloom to the base, stirring gently. Pour the hot marshmallow slurry into the bowl of your stand mixer and gradually bring the mixer to high speed. There may be splatters as the marshmallow mixture starts off very thin. Feel free to cover your mixer with a towel until the mixture cools and thickens. Beat the marshmallow for 8-10 minutes and then spread the layer into your pan. Once you've added the final layer, spray a couple sheets of aluminum foil with non-stick spray and cover. Don't press the foil down against the marshmallow, this is just to keep anything from falling (or flying) into your pan, which is quite sticky while the marshmallow cures. Allow the marshmallows to cure covered for several hours, or overnight. Once they've firmed up, you can prepare your dusting mixture and slice! Using an lightly oiled knife or pizza cutter. Cut a quarter slab from the marshmallow sheet and begin cutting it into strips. Keep your marshmallow slab and surface well dusted with the dusting mixture to prevent any sticking. Cut the slab into strips, dredging each strip through the dusting mixture after cutting. Then cut the strips into cubes. Toss the cubes in the dusting mixture to coat. Shake the cubes in your hands to remove the excess. That's it! You're done with your marathon of marshmallow making. Now sit back and bask in the cuteness. You can eat a few too. Go ahead. To store the fruits of your effort: Separate layers of marshmallows with parchment or wax paper in a container with a loose fitting lid. Marshmallows will dry out if left completely uncovered, but they do need a little air for the longest shelf life (up to 2 weeks). Wow. I'm smitten. However, I no longer have a stand mixer, only two (fairly powerful) hand mixers. The last time I made marshmallows, I taxed my roommate's stand mixer fairly heavily. Any advice for doing this without overheating the electric mixer you're using, be it handheld or tabletop? Homemade marshmallows are my absolute favorites! Yum!!! Yea, marshmallows can be hard on your mixer. (Even those that are powerful. I shot a nice Breville mixer with italian meringue). The trick is to not allow the marshmallow mixture to cool completely during the beating process. It will thicken as it cools and the thicker it is, the harder it is on your mixer. The beating process is to incorporate air while it cools and nothing more. Continuing to beat while the mixture is room temperature is unnecessary and hard on the mixer. Moreover, the marshmallow is difficult to spread and work with if it has cooled too much. Watch the marshmallow as it beats, once it has thickened (gets thready on the beaters is the best way I can describe it) and the bowl feels comfortably warm (not hot) you can cease beating even if you haven't hit the allotted time. Some mixers will do a better job and complete the process faster. I used multiple mixers making these and I noticed my Kitchenaid did the job faster than my Breville. Throwing an ice pack on the arm of mixer won't hurt either, and/or letting it cool down completely between batches. i sooooo want to eat one right now! plus the final product is absolutely adorable! I've wanted to do layered marshmallows for some time but just haven't done it yet. What a beautiful presentation! I love making marshmallows! These are super cute and right up my alley :) Glad that you used candy oil, making strawberry puree on top of every sounds like it would be a lot of work! LOVE LOVE LOVE, what a fab idea! Great gift too. Oh my gosh, these are so darling and genius! I'm making these as soon as I find a good excuse to. I really want to try homemade marshmallows. This looks so fabulous and great for gift giving. These are pure perfection!! Love how both simple and stunning they look. I just about killed my stand mixer making a double batch of divinity this past Christmas. I am a little afraid to try marshmallows, but these look incredible!!! these are the most "elegant" mallows i have ever laid eyes on! & they certainly look "the effort!" you are my hero, my dear ms. h! With all my heart I love homemade marshmallows. These are just beautiful! I make homemade marshmallows (dipped in chocolate) every year at Christmas and my family still doesn't understand how you can MAKE marshmallows (or why they're square instead of cylindrical). But these are a work of art! This recipe would definitely up my mallow-making game! Seems a little difficult to make, but looks so yummy! I love how you placed a flower on the jar. Very cute! Has anyone used egg whites in their marshmallows? The few recipes I've come across call for them, and I've followed these recipes in my last batch, but do they really lend that much to the final taste/texture? I'd rather not have raw egg whites in there. :) thanks in advance! I've made plenty of marshmallows both ways, with and without eggs. In truth, there really isn't a great deal of difference between the two types. If I were forced to differentiate though, I would say that in recipes where I do use eggs, the resulting marshmallows seem just a little lighter and more delicate. Not better or worse, just a tiny bit different. Also, I wouldn't worry too much about the egg being raw. Once you dump a pan of 200°F+ molten sugar into the beating bowl, that egg white is cooked. These are just too cute! 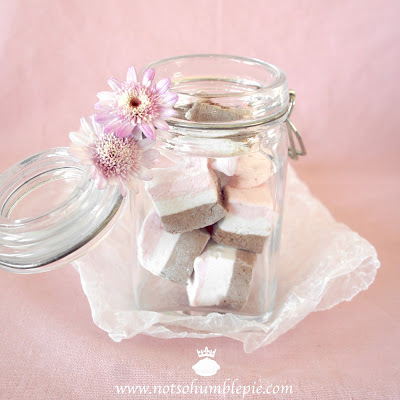 I love making marshmallows but have never made something so adorable - I'm bookmarking the recipe! Would you recommend tackling this recipe if you're new to making marshmallows? I want to make a selection of goodies to send out for Christmas, but I'm a bit nervous about the level of difficulty. These take time but are not terribly hard. If you can make a single flavor marshmallow you can do these too. Go ahead and try making a simple batch of vanilla or chocolate, if those turn out you're ready to move on to layers. Or, if you're already comfortable with other homemade candies or italian meringue, you should be able to handle layered marshmallows. they are the best marshmallows I've ever seen! honestly perfectly divided and really cute! how much strawberry purree would be needed?